The S800-series of modular RF shielded enclosures are based on a series of interchangeable panels which can readily be installed, modified or expanded, and incorporate the latest techniques and developments in shielding engineering,. 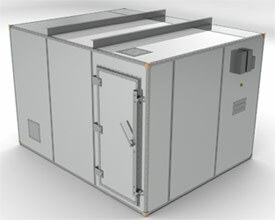 The S800-series of modular enclosures can easily be installed in enclosed areas utilising a free standing framing system that allows erection from inside the enclosure. The EMI/EMC Laboratory division offers a wide range of EMC testing capabilities to local and international standards such as AS/NZS (C-tick), EN (CE Mark), IEC, CISPR, FCC, VCCI, MIL STDS, DO160, ANSI, IEEE, SAE, VDE, and more. The Laboratory can handle EMC testing for a wide variety of items ranging from small household appliances to large military vehicles. R.F.I. Industries Pty Ltd has ceased trading.